[PDF] An Introduction to Queueing Theory: Modeling and Analysis in Applications (Statistics for Industry and Technology) | Free eBooks Download - EBOOKEE! Description: This introductory textbook is designed for a one-semester course on queueing theory that does not require a course in stochastic processes as a prerequisite. By integrating the necessary background on stochastic processes with the analysis of models, the work provides a sound foundational introduction to the modeling and analysis of queueing systems for a broad interdisciplinary audience of students in mathematics, statistics, and applied disciplines such as computer science, operations research, and engineering. Key features: * An introductory chapter including a historical account of the growth of queueing theory in the last 100 years. * A modeling-based approach with emphasis on identification of models using topics such as collection of data and tests for stationarity and independence of observations. * Rigorous treatment of the foundations of basic models commonly used in applications with appropriate references for advanced topics. * A chapter on modeling and analysis using computational tools. * A comprehensive treatment of statistical inference for queueing systems. * A discussion of operational and decision problems. * Modeling exercises as a motivational tool, and review exercises covering background material on statistical distributions. An Introduction to Queueing Theory may be used as a textbook by first-year graduate students in fields such as computer science, operations research, industrial and systems engineering, as well as related fields such as manufacturing and communications engineering. 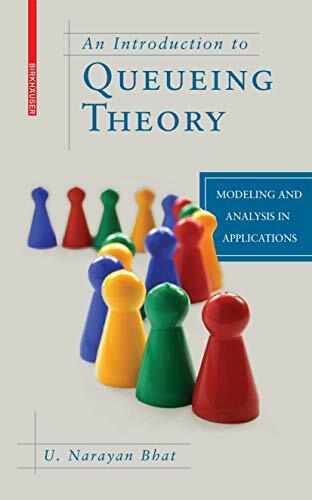 Upper-level undergraduate students in mathematics, statistics, and engineering may also use the book in an elective introductory course on queueing theory. With its rigorous coverage of basic material and extensive bibliography of the queueing literature, the work may also be useful to applied scientists and practitioners as a self-study reference for applications and further research. No comments for "[PDF] An Introduction to Queueing Theory: Modeling and Analysis in Applications (Statistics for Industry and Technology)".